An Israeli submarine attacked an arms depot in Latakia last week, according to intelligence sources. The recent strike on an arms depot in Latakia was a naval intervention and not an airstrike, Middle East intelligence sources told the Sunday Times newspaper. According to the report, the attack was carried out using a Dolphin class submarine and was well-coordinated with the United States administration. If the report is correct, it would be Israel's first naval intervention in Syria. The officials also told the Sunday Times that the attack targeted 50 Russian-made Yakhont anti-ship missiles. 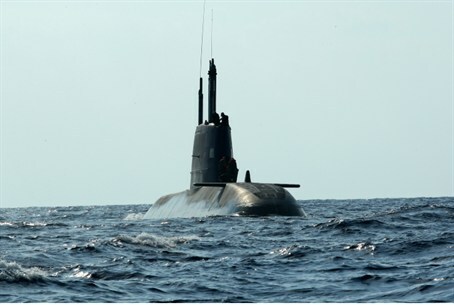 Israel has purchased five Dolphin class submarines from Germany. Reports last year indicated that missiles with nuclear warheads were deployed on three of the submarines. On Friday, officials told CNN that the series of explosions at Latakia port on July 5 were the result of airstrikes by Israeli warplanes. Qassem Saadeddine, a spokesman for the Free Syrian Army's Supreme Military Council, said that the rebels' intelligence network had identified newly supplied Russian Yakhont missiles being stored in the depots that were hit. "It was not the FSA that targeted this," Saadeddine said. "It is not an attack that was carried out by rebels. "This attack was either by air raid or long-range missiles fired from boats in the Mediterranean," he added. Rebels described hearing and seeing huge blasts, the ferocity of which, they said, was beyond the firepower available to them but consistent with that of a modern military force like Israel's. Israel has not officially commented on the incident. Defense Minister Moshe Ya'alon said on Tuesday that Israel does not interfere in the affairs of neighboring countries, but it does act when its red lines are crossed. Some interpreted these remarks as a hint that Israel may have been involved in a strike in Syria. "We’ve established red lines regarding our interests and we maintain them. Whenever there is an explosion or attack over there, the Middle East blames us anyway,” Ya'alon said vaguely. Meanwhile, an official Syrian source denied Saturday evening that the explosions were the result of an Israeli attack. Al Ahlam, an Iranian television channel, quoted an official from Bashar Al-Assad's government who denied that Israel had bombed the harbor at Latakia.